All I needed to hear was the name: the Iceline Trail. 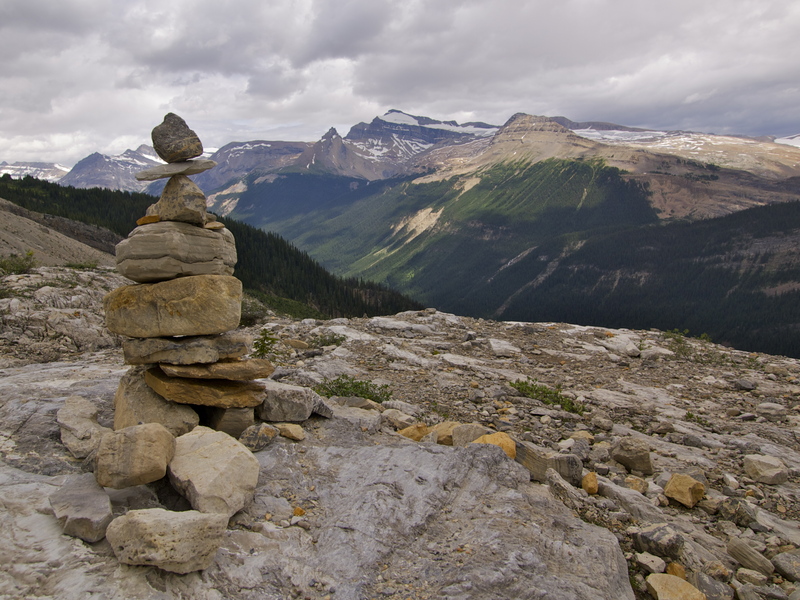 Yoho National Park’s most popular trek switchbacks up the back side of the Presidential Range and then runs along the bottom of the Emerald Glacier, crossing rocky moraines and glacial creeks for miles before dropping back down into the Yoho Valley. My parents – celebrating their 33rd anniversary this week! – at Takakkaw Falls. 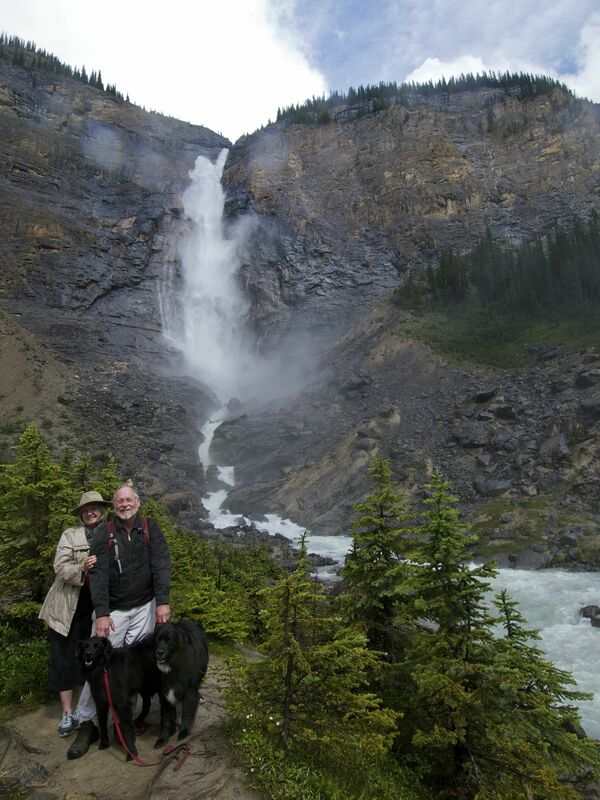 Keep an eye out for this waterfall throughout our hike and you’ll have an idea of how much ground we covered! My dad and I set out for the Iceline trail early in the morning, pledging to turn back at the tree line if the gathering clouds looked like they might bring dangerous weather. Fortunately, lightning luck was on our side and we got no more than a sprinkle of rain all day. 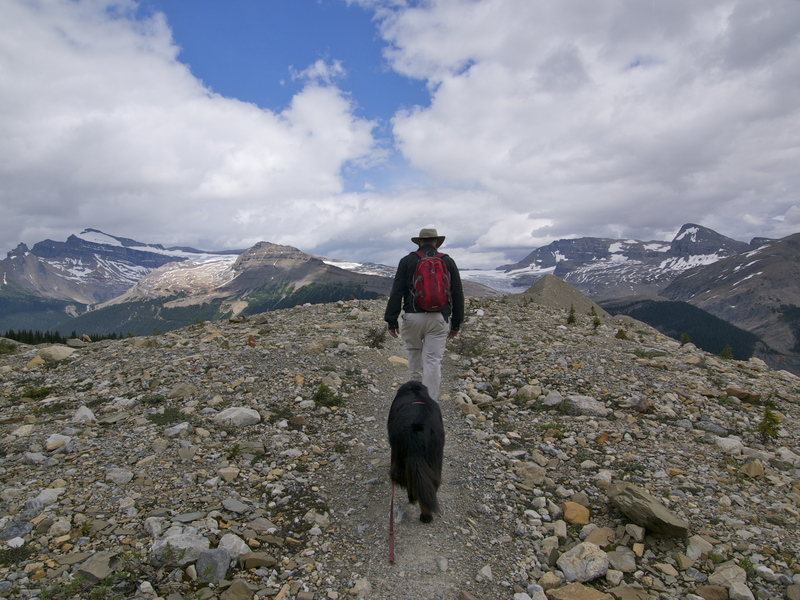 Dad & the dogs above tree line on the Iceline Trail. 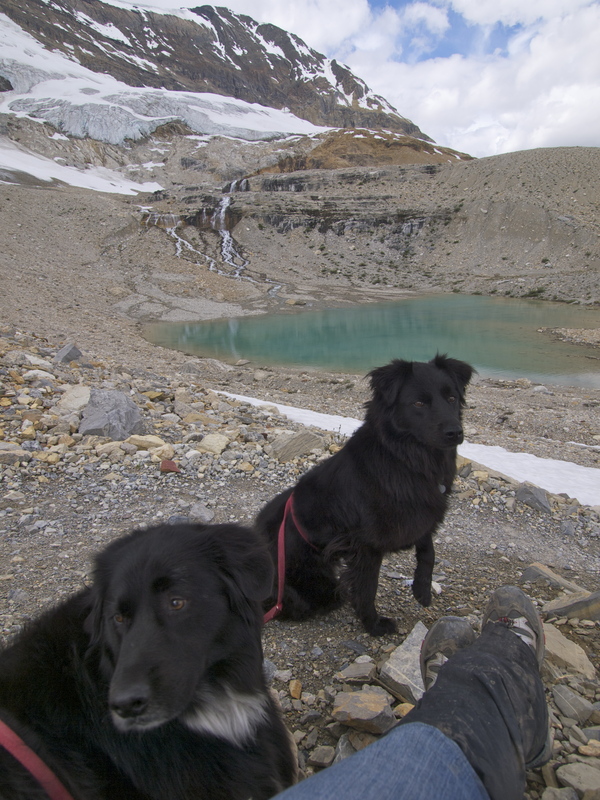 Notice Takakkaw Falls below on the left. We walked from the base of the falls to here! Me & Dad and Our Hats. We bought them separately and picked out the same brand in similar styles. Is it possible that hat preference is genetic? Dad at our trail junction. 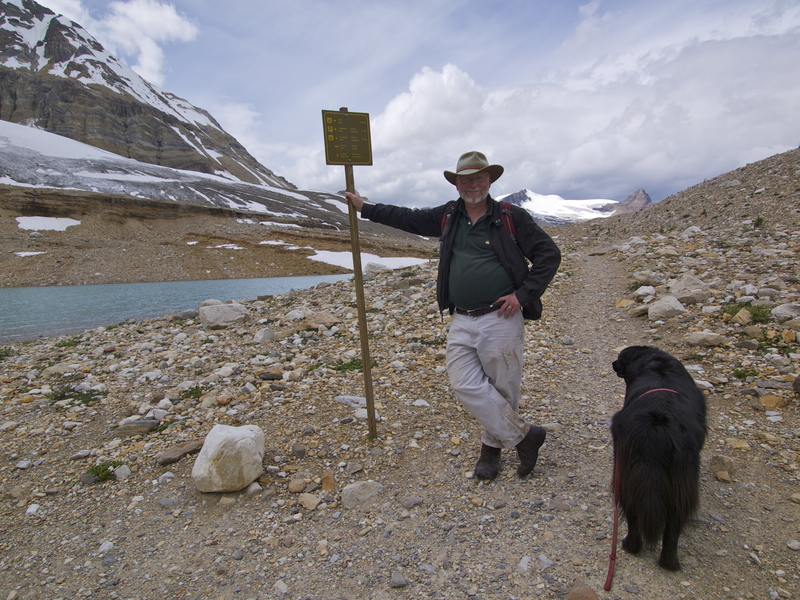 We hiked up from the Whiskeyjack Hostel, across the Iceline trail to the Celeste Lake trail and back down the Yoho Valley trail for a 17 kilometer loop. Returning to the parking lot around 5 pm we were puzzled to find dozens of people lounging around, reading books in camp chairs, sleeping on picnic tables and on car hoods, playing cards and cooking food on camp stoves, all with an odd air of resignation. Then we found out why: we were trapped! 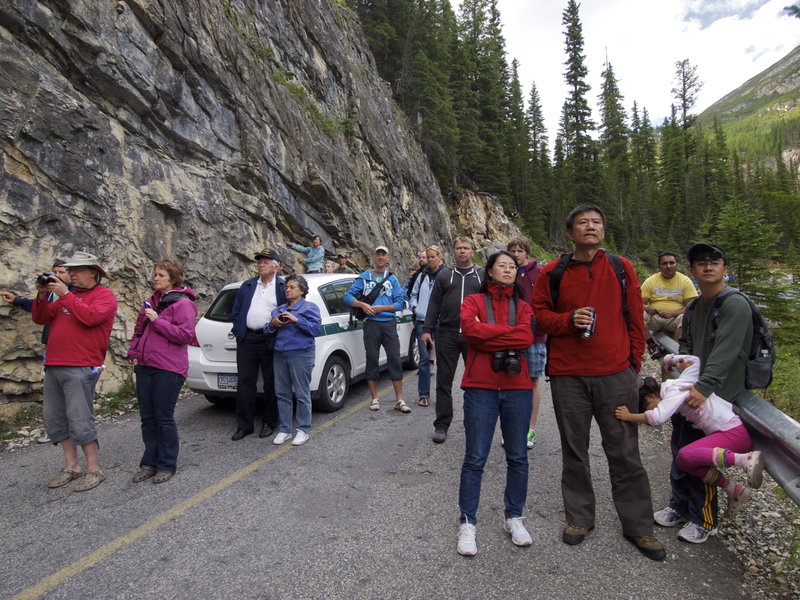 Around noon a tour bus had gotten stuck on the switchbacks on the only road back to town and nobody could get off the mountain! Bizarrely, this is the second time in my life that I’ve been trapped on a mountain by a bus. Years ago, in Ecuador, on the way down from Gua-Gua Pinchincha, our Land Cruiser rounded a muddy turn to find an abandoned bus wedged across the narrow road. Having just summited a 15,700-foot mountain, we had no choice but to relace our boots, get out of the Rover, climb over the bus (easiest climbing we’d done all day) and hike an hour in the pouring rain and the deepening dark to the next town, where we could call a cab back to Quito. 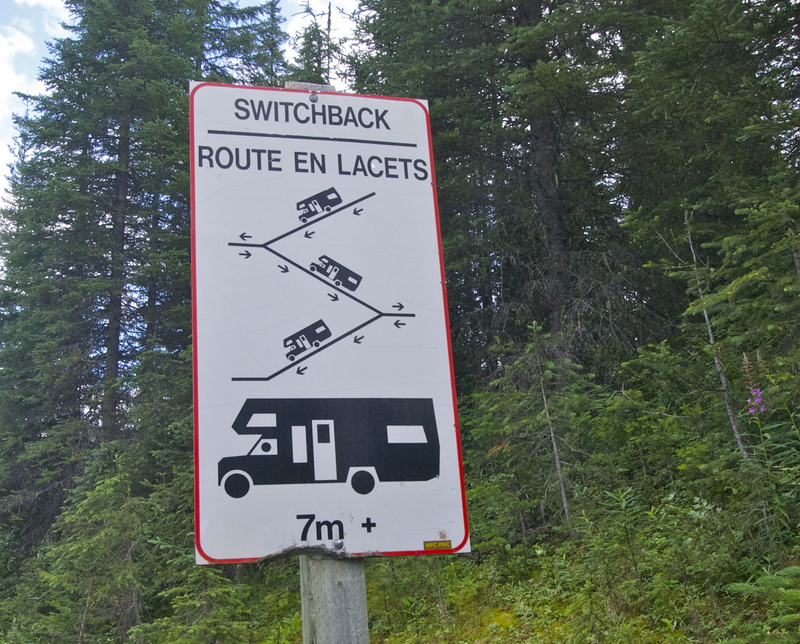 This is how oversized vehicles are supposed to drive these switchbacks: go in reverse between the first and second turns. Ridiculous that they even let buses attempt this maneuver! When things go wrong in the mountains, or on the drive down from the mountains, there’s not much you can do other than Deal With It and remind yourself: it can always be worse. At least in Canada, they have cranes to move stuck buses and we didn’t have to hike out. While we waited, the park rangers brought us all fruit, granola bars and water and everybody was remarkably patient and pleasant, even jovial. We all watched the crane jockey the bus out of the way – prime entertainment, let me tell you – and once it was free, just after 7 pm, we all cheered! My fellow stuck bus spectators. I think that kid was the only impatient one among us! You sure get to see some great spots – well done. great photos of a place I hope to get to soon. We are in New Hampshire hiking the Presidential’s here, they are not as spectacular as yours. That’s quite the road! Never really seen such zigzags–although we have some interesting roads in Colorado. Love the glacial lake. 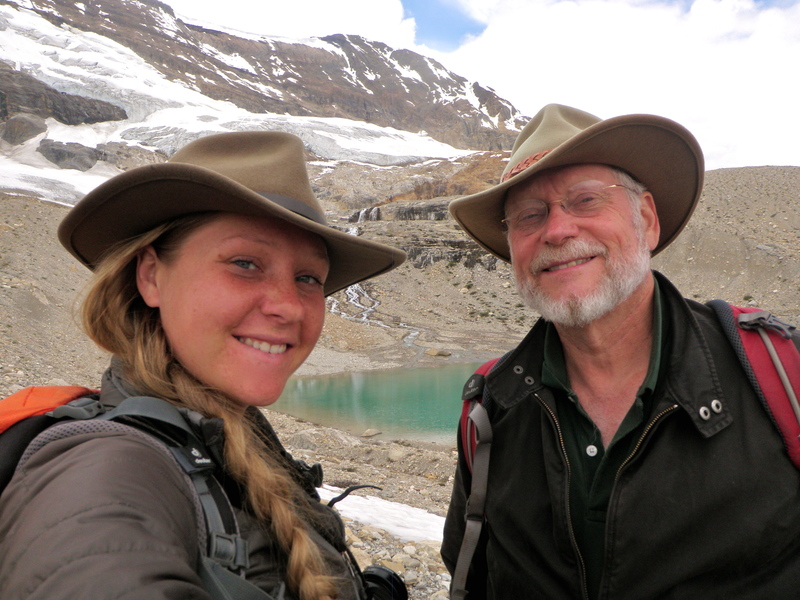 You should be very proud of your dad to be able to hike like his young daughter! Good for him. 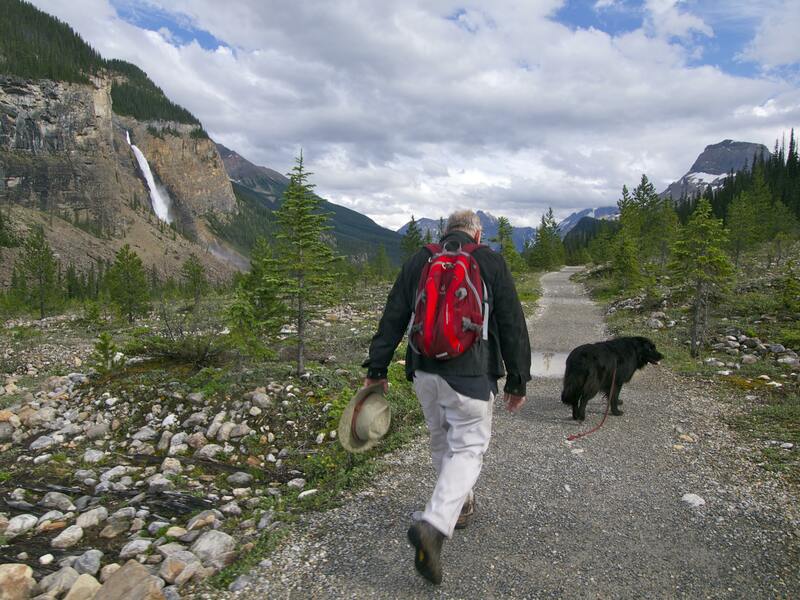 My son hikes and I could never keep up with him….but one day. Oh I am! I’ve always been the one trying to keep up with him! He’s a respectable country doctor these days, but he hasn’t forgotten his West Virginia mountain man upbringing! Hi Mary, You certainly look like your dad,how nice to be walking together in such a spectacular place. 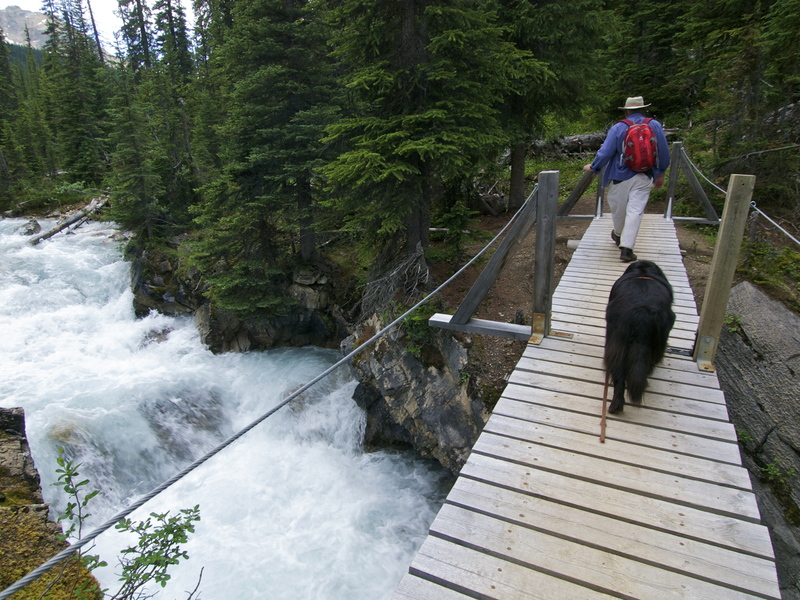 That glacial creek crossing looks pretty scary,Im not good walking those,they sway to much. You don’t seem to look very cold, was it cold? Love the pics thanks again for sharing your lovely life. WOW!! What a way to end a hike. Trying to drive that tour bus up that road must be like putting the ship in the bottle. Love your blog! Haha that’s a great way of putting it! I wouldn’t dare try driving my Teardrop up there, let alone a bus! I’ve been in a bus on one of those roads where they had to drive out on the apron, then back down to the next apron, then forward again. It had a special short wheel base so it could fit on the apron, which meant it stuck way out over the edge. Worse yet, the road was dirt and cut into the side of a giant scree slope. Most hair raising bus ride I have ever been on. That’s on the road down to the Bella Coola Valley, and a long time ago. Maybe its different now. I just came across this blog of the Bella Coola highway which you might want to check out if ever contemplating taking the teardrop down this hill. I once did it in the dark, which was OK, but pulling into the campground at the bottom of the hill saw 7 different grizzlies in the headlights and decided to sleep in the truck and not the tent.